Please put initials you want in buyer "notes" to Frosted Willow during checkout for your sterling silver initial bracelet(s). The sterling silver bracelets make great gifts for teen girls because of the purity of the metal. Sterling silver is suggested for teens. 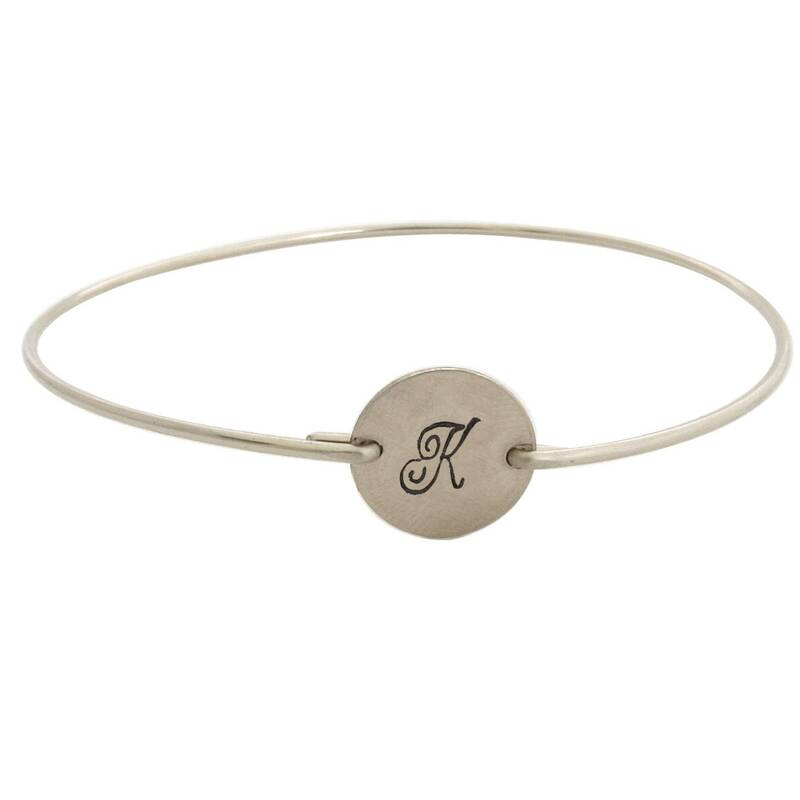 I custom make these dainty personalized sterling silver initial charm bracelets on a sterling silver disc with a sterling silver bangle band. 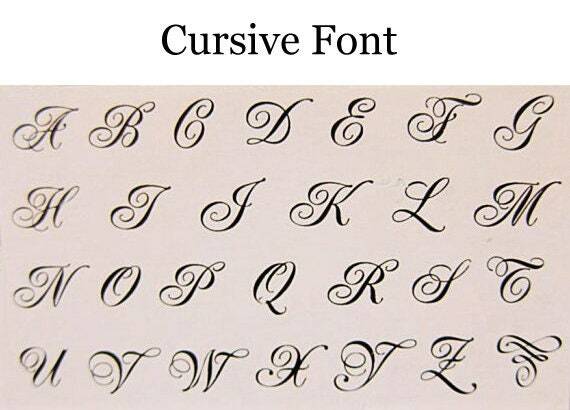 Select font choice in fancy font or cursive font. And if you want the initial darkened for "contrast" which shows better, or if you want the initial stamped clear with no darkening for your personalized sterling bracelet. 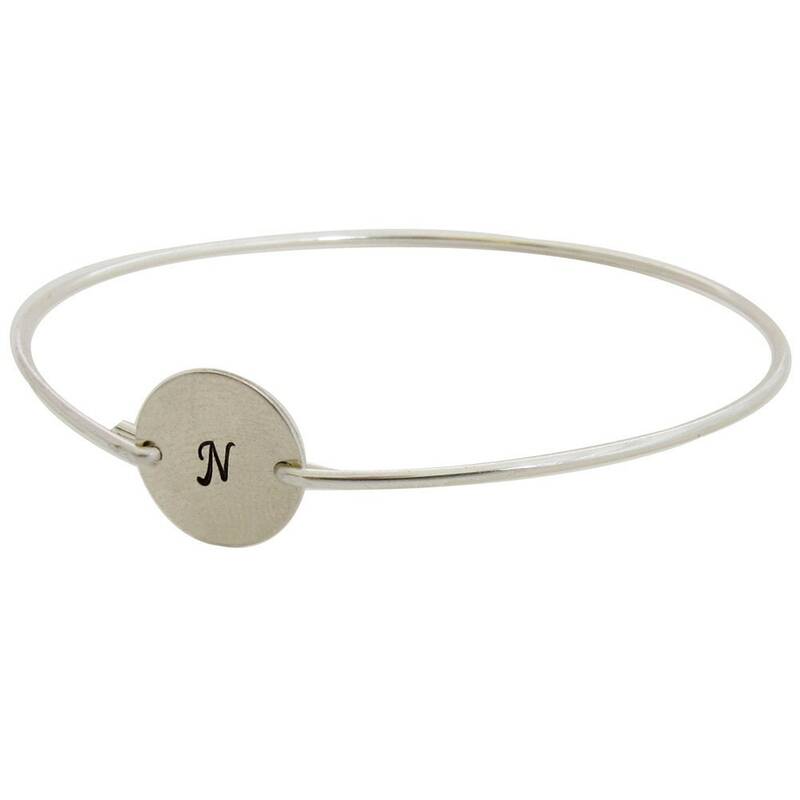 This makes a great gift for teen girls since all elements of the bracelet are sterling silver including the disc & bangle band. Sterling silver is suggested for teen girl jewelry because of the purity of the metal. And it's great for adults too. 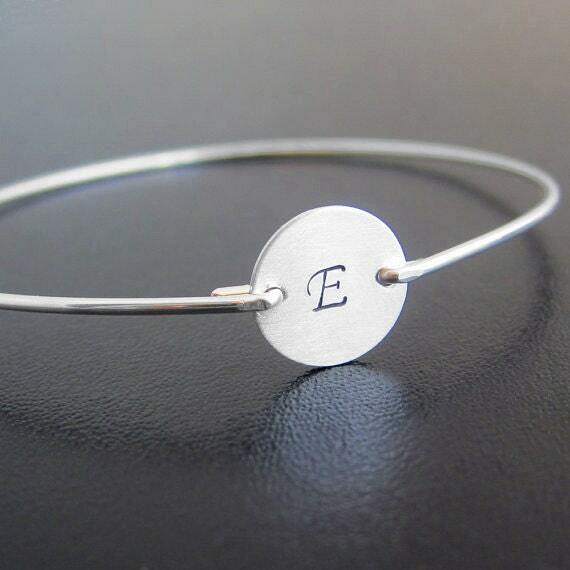 Please specify size in notes during checkout for your sterling silver initial bracelet bangle. 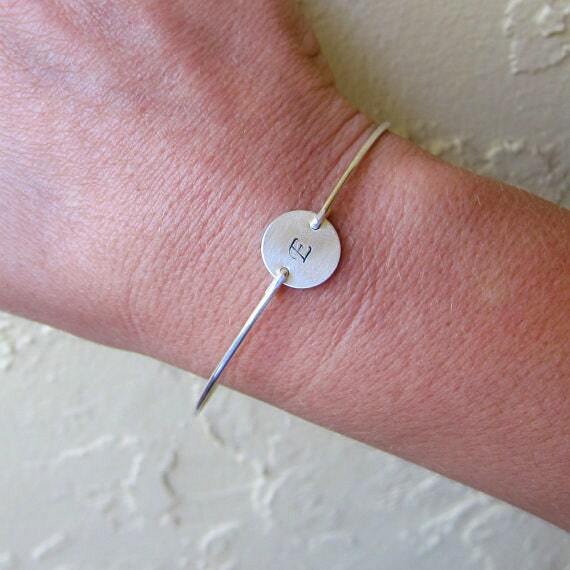 Choose from one of my regular sizes below by measuring one of your favorite bangles, or give me the circumference of the widest part of your hand where the bangle has to be pulled over; then I can size your personalized initial bangle bracelet for you. All of my bangles are closed and can’t be opened. Therefore, they have to fit over the hand. See easy choice size chart below. Please mention sizes in "Notes to Frosted Willow" during checkout. If you need any help choosing size please message me after ordering. My size chart below is easy to pick from without even measuring hand circumference. Just match general size of wearer to the description, and it should be a very close fit. It's meant to be easy. After handcrafting over 100,000 bangles in my life i developed these sizes to help people choose a size without measuring... If you want to measure, please see instructions below after the size charts. If gifting bangles and unsure about selecting a size from the main size chart, I can make in-between the "two most likely sizes" for that person, and it should be a very good fit. See in-between size chart below. Usually 2 or 3 different sizes can work for the same person because my sizes are so close together. This makes it very easy to choose a size within the right range without measuring. If in doubt, choose the larger of the two sizes you're considering. Better to be a little bit over than a little under. For example, if you are deciding between a Main Size and In-Between Size, choose the larger of those two sizes if you are unsure which is best. XSmall: 7.5 inch circumference - Slender hand - narrower than the average adult, larger than average teen. Small: 8 inch circumference - MOST COMMON SIZE - average size woman. Medium: 8.5 inch circumference - 2ND MOST COMMON - medium adult hand size. Large: 9 inch circumference - Larger adult hand size. XLarge: 9.5 inch circumference - Extra large adult hand size. If you are caught in the middle.. Or unable to measure for gifts. And stuck deciding between two main sizes above. Each between size is just 1/4 inch apart (.25 inch apart) from main sizes above. 6.75 inch: Between XPetite & Petite - half size smaller than average teen hand. 7.25 inch: Between Petite & X Small - half size larger than average teen hand. 7.75 inch: Between XSmall & Small - half size smaller than average adult hand. 8.25 inch: Between Small & Medium - half size larger than average adult hand. 8.75 inch: Between Medium and Large - half size larger than medium adult hand. 9.25 inch: Between Large & XLarge - - half size above large adult hand. I can always resize any bangle if not a perfect fit. I don't charge any resizing fee. I want everyone to know their true size, and to be a repeat customer. My Frosted Willow shop has over 500 original bangle bracelet designs.